Give your young explorer a summer surrounded by nature. Hands-on outdoor adventures, nature crafts, live animals and more! One day programs will introduce participants to the Hatchery and surrounding natural environment through outdoor activities, arts and crafts. Different themes each day allow participants to sign up for 4 different programs: Fancy Fish (Mondays), Turtle Tuesdays, Amazing Amphibians (Wednesdays) and Recycling (Thursdays). Curious Naturalists will view the natural environment in and around the Hatchery. The curiosity of the participants will be encouraged through natural expeditions to the neighboring pond and woodland habitats. Children will get wet and muddy during hands-on activities. 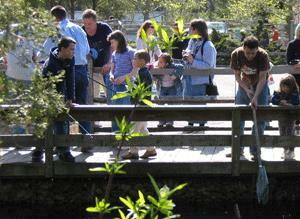 Curious Naturalists will have an opportunity to spend an extra day exploring Franklin’s Pond. 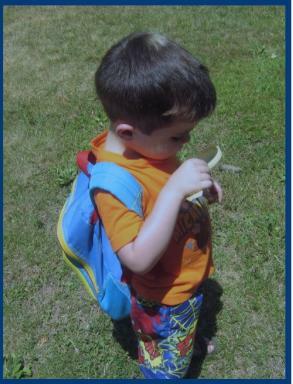 Must have participated in Curious Naturalists during 2016 before the Pond Adventures program. Young scientists can cool off during a hot summer day while experimenting with ice and making homemade ice cream. Slime is a sticky, slippery substance used by many animals to help them survive. 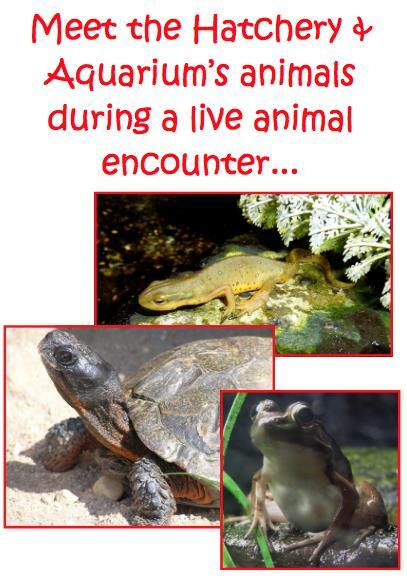 Students will make their own gooey slime and meet animals that use slime to help them survive in the wild. Step inside the Mad Scientist Laboratory for a day of fun and crazy science experiments. Tornados? Snow? Rain? Clouds? The weather can be wild and wacky sometimes. Learn all about the weather with fun hands-on experiments. Field Explorers have fun learning the facts concerning our environment. Children will become more aware of our delicate environment as they explore the nearby salt marsh, pond and woodland habitats. As we wade through the water, we will study the environment and the animals that inhabit our field sites. Prepare to get wet and muddy! Dive deeper into the field of biology as Junior Biologists learn how to study and explore our environment. 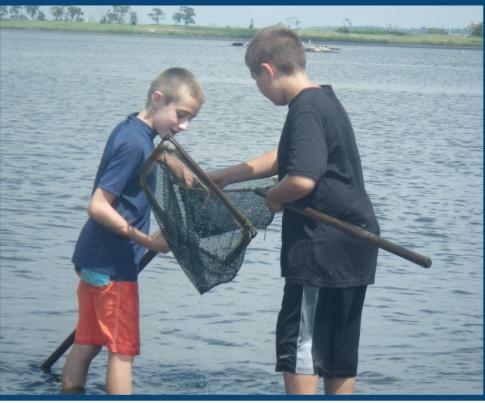 Students will use scientific techniques to explore the salt marsh, freshwater pond and woodland habitats. Be prepared to get wet and muddy! Field Explorers and Junior Biologists will have an opportunity to spend an extra day exploring Franklin’s Pond. Must have participated in Field Explorers or Junior Biologists during 2016 before the Pond Experience program. 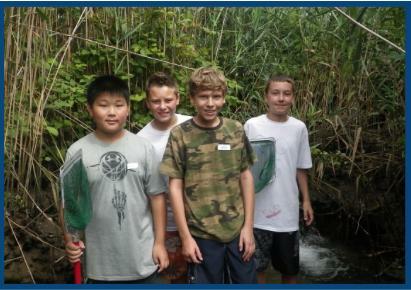 Field Explorers and Junior Biologists will have an opportunity to spend an extra day exploring the salt marsh. 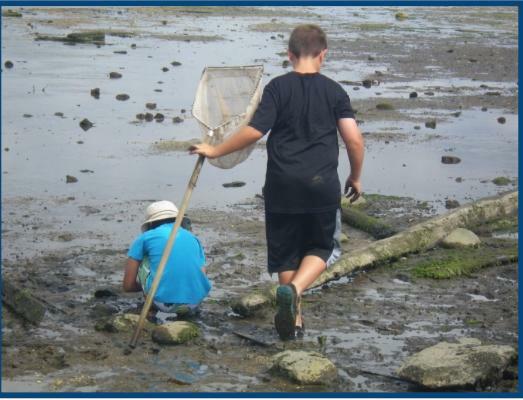 Must have participated in Field Explorers or Junior Biologists during 2016 before the Salt Marsh Exploration program. Young students will learn how to use a camera to capture photographs of animals and nature. Bring your own camera or borrow one from the Hatchery. Each student will be able to take their pictures home. Campers will learn how to use a map and compass to complete navigational challenges around the Hatchery and while hiking through the neighboring St. John’s Pond Preserve. Learn the art of fly fishing. Lessons in fly tying and fly casting will be taught. Learn about these fascinating reptiles that have roamed the Earth for millions of years. Students will practice techniques used by scientists to collect and study turtles. We will be spending a lot of time outdoors, and hopefully catch a few turtles! Is your child participating in more than 1 camp program on the same day? A supervised lunch will be available on the following days for children attending both the morning and afternoon camps. Bring a bagged lunch. Learn what it is like to work at a summer camp while you gain leadership skills and participate in fun, outdoor adventures. Tuesday & Wednesday Mornings - 10am. Begins September. Free with admission to the Hatchery & Aquarium. Join us for an hour of fun-filled nature activities (fish feeding included). Crafts ~ Stories ~ Games. Coffee, Tea, Juice & Snack will be available. 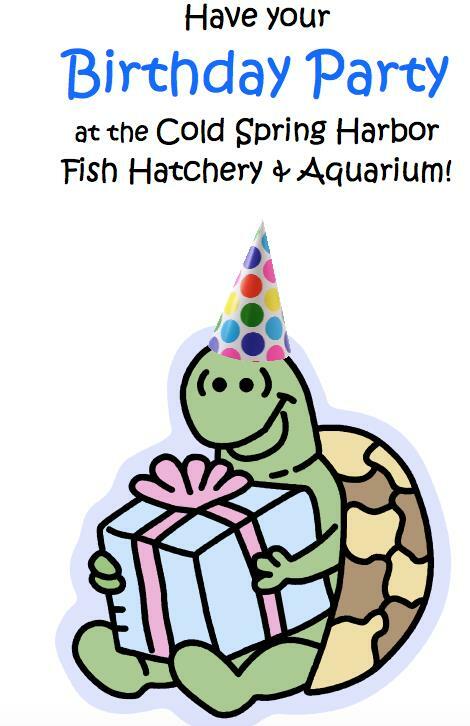 Consider having your child's birthday party at the Cold Spring Harbor Fish Hatchery & Aquarium this year. 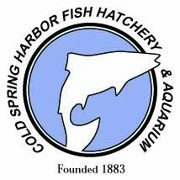 All birthday parties include a 1 year Family Membership to the Cold Spring Harbor Fish Hatchery & Aquarium. 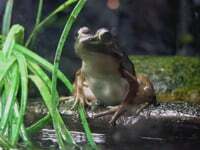 See the Hatchery & Aquarium's live exhibits. 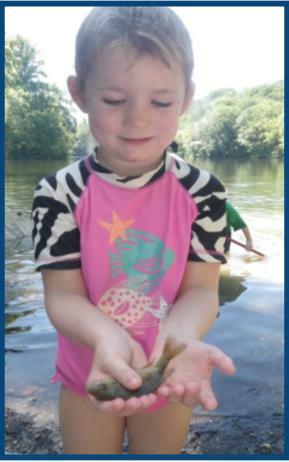 Feed the hungry trout and learn about fish, reptiles and amphibians with an up close animal encounter. For children turning ages 3 and up. 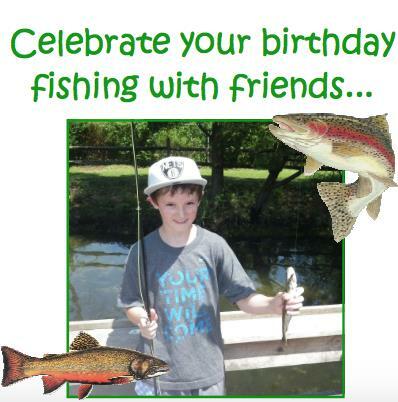 Party goers will enjoy a 45 minute fishing bonanza followed by your desired festivities. Fishing is catch and release only. For children turning ages 4 and up. Want to have the Cold Spring Harbor Fish Hatchery & Aquarium to yourself? The Hatchery is now available for rent after hours. Parties can be scheduled to begin after 5pm or 6pm on summer weekends. All trout caught MUST be kept and are $4 per fish. Bring your own fishing equipment or rent from the Hatchery. Fishing is on a first come, first serve basis, no more than 12 fisherpeople on the fishing platform at a time. Only paid fisherpeople may enter the fishing platform. Fishing will only take place on the fishing platform during designated times. Fishing poles may be rented from the Hatchery, one hook & bobber included in the rental. Rental fees must be paid at the time of rental. Bait and additional hooks & bobbers may be purchased in the Gift Shop. Part of the fishing experience is baiting and removing fish from the hook yourself. Personal fishing equipment, with the exception of fly fishing rods, may be used. The Hatchery is not responsible for the loss or damage of personal fishing equipment. ** A fishing fee of $5 per person will be paid before entering the fishing platform. ** All trout caught will cost $4 per fish. 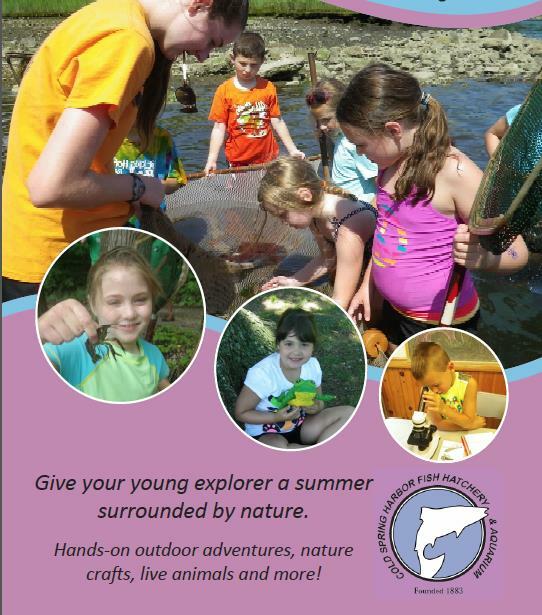 Young explorers, grades pre-K-12th, spend summer surrounded by nature. Encourage their love of science with hands-on activities, nature crafts, live animals, and outdoor adventure nature camps. Expeditions to nearby salt marsh, ponds, and woodlands. One-, to four-day camps available. Summer fun at a great price! Prepare to get wet and muddy!